If you are one of the many who enjoy walking as your form of physical activity, we’re sure you like to shake up your route every once in a while. Walking the same path can get redundant and make your exercise less exiting and enjoyable. Today we’d like to propose a local landmark to spice up your daily walk. 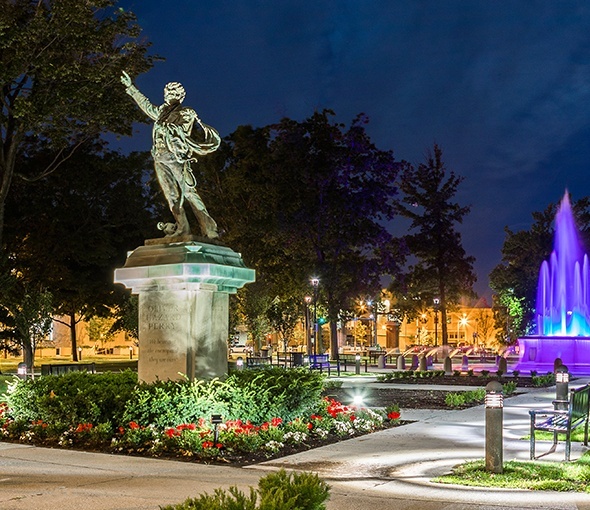 The Perry Square Park is a breath of fresh air in the middle of our bustling city, so if you usually walk around the block or through town this is the perfect detour to help revamp your daily walks. The park is often home to a myriad of annual events throughout the year including Celebrate Erie, Roar on the Shore and Downtown d’Lights. The environment is the perfect place for a peaceful lunch break or a perfect ending to a summer day. During the evenings the center fountain has changing LED lights that light up the water throughout the night, and twenty benches offer themselves to guests if you so choose to stay and watch for a while. This park is just another way to shake up your regular routine while also appreciating our local Erie beauty. Many people drive past the park every day and have never walked through the square, don’t be one of those people!